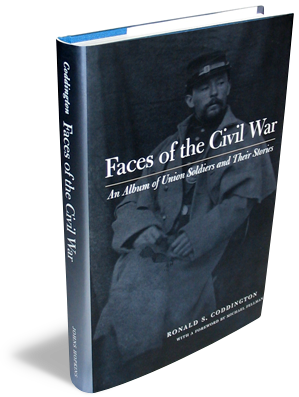 Faces of the Civil War: An Album of Union Soldiers and Their Stories is the realization of a boyhood dream to someday write a book. Years passed and the dream faded. Then, in 1999, I decided to act and turned to my collection of original Civil War soldier portraits for inspiration. My first idea was to self-publish a coffee-table book of images and selected a representative group that were visually compelling. I decided that each image would benefit from a caption and selected one of the photographs at random, who happened to be identified. I noted his name, rank and regiment. After a short subway trip from my home in Arlington, Virginia, to the National Archives in Washington, D.C., I requested the military service record and pension file for the soldier, Capt. Edward Richmond Washburn of the Fifty-third Massachusetts Infantry. I read his personal papers with intense interest, and followed the story of his enlistment in 1862 to his wounding at Port Hudson, Louisiana, in 1863, and his tragic death at home in Massachusetts in 1864. In an instant I knew that captions were not adequate. Moreover, that the ability to study the face of a soldier and read the story of his military experience was a unique and powerful entry point into the human side of our country’s greatest national crisis. I spent the next four years researching, writing and working with The Johns Hopkins University Press to publish this volume. The staff of Hopkins Press suggested that the book jacket cover feature an image of an unidentified soldier to represent the millions of faces of ordinary men who volunteered to serve in the Union armies. I wholeheartedly approved of the idea, and knew exactly which carte de visite I would choose to grace the cover. 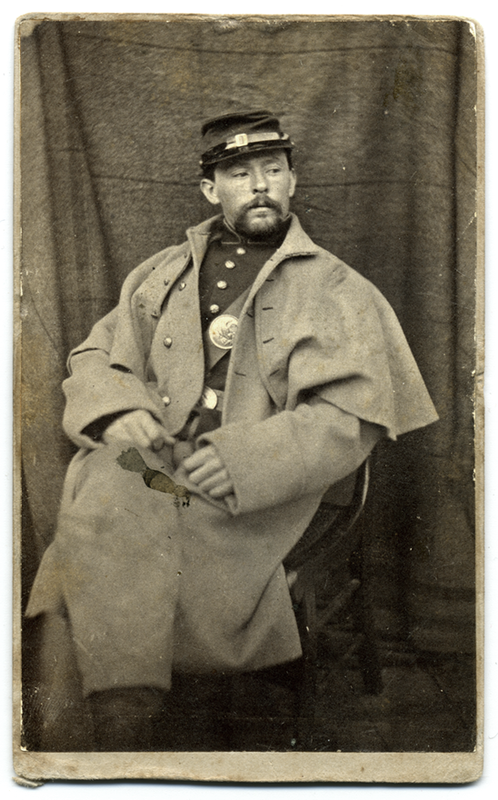 The unknown soldier pictured in this carte de visite sits on a simple chair on a floor made of rough boards and draped by a curtain or blanket, indicative of an itinerant photographer, or a photographer who traveled with the hometown troops and set up shop on the outskirts of camp. In any case, there is no marking on the front or back of the image to tell us who took this image, or any clue as to the identity of the subject. He wears a greatcoat, which covers most of his uniform: A section of his oval waist belt plate is visible, indicating that he is an enlisted man. In plain site is the federal eagle breast plate and belt, which was attached to a cartridge box hidden by his coat. He also wears a standard issue forage cap. His head is ever so slightly turned away from the camera, and his eyes are turned downward. This is one of my favorite images. I puchased it in the 1990s from Henry Deeks, a dealer in American carte de visite portraits for more than thirty years, and one of the most knowledgable collectors in the field. My great grandfather, Alexander Turner, 6th Calvary, Company K enlisted in the USCT in 1865, to secure his freedom at age 18 in Harlan, KY. I’m constructing our family tree and I’m hard pressed to find any productive information on him. I would love to have a photograph – please tell me where I can begin? Best Regards. Best place to start is with your family. You may be surprised to find old photos that may go back as far as the Civil War era. I also recommend you go local—check with historical societies in all the places where your great grandfather lived. Someone somewhere may have donated relevant documents and photographs. Lastly, I suggest you continue to get the word out on social media. I estimate that four million photographs of Civil War soldiers are scattered in homes, and public and private institutions, across the country. Your ancestor’s image may very well be out there somewhere.